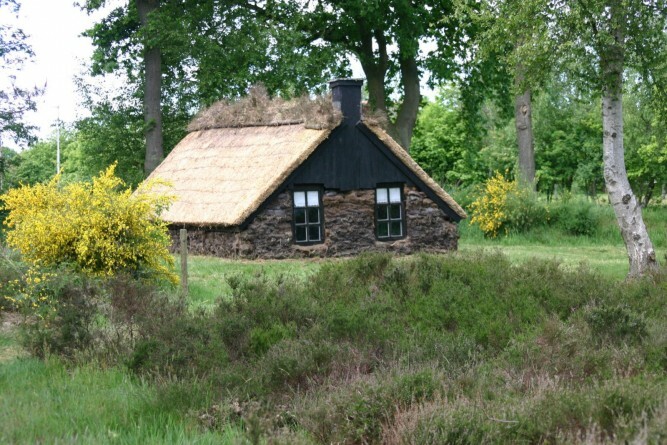 Living conditions on the Groningse and Frisian heath between 1850 and 1950 were extremely poor. Below you will find more information on how people survived on the heath: the different types of dwellings and the conditions in which poor people had to live. 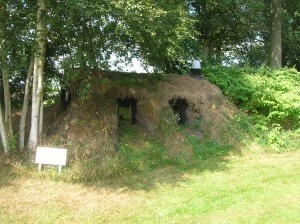 A ‘Spitkeet’ was a shelter built up from sods, some wood and rush, in the 19th and early 20th century. These shelters were often built in a single day for the poorest of poor. They often housed big families in very poor living conditions. Child deaths were common. Men, women and children tried to make some money by doing seasonal labour. These stone houses were built for people who were slightly better off. This is a replica of a house built here in the 19th century. The front of the house was used as living space with a few bedsteads, while cattle were kept in the back. This belfry belonged to the cemetery of the poor, established in 1870. Even the poorest of people (the council paid for their funerals) wanted to be laid to rest properly. Before the belfry was built in 1879 no one was buried here because of the belief that the ringing of bells was needed to frighten away evil spirits during a funeral. They had to wait 9 years for the belfry to be built so they could ‘safely’ bury people. In the 19th century there were people in this area who made use of a hill or a dike in the land to make a shelter. They dug a hole and strengthened it with wooden beams and poles. They further built up the walls and ceilings with grass or heather sods. Sometimes they had little window openings, often they didn’t. The cave had a little hearth with a chimney or opening in the ceiling. A small table and a simple bed was all they had. Sjoerd út de wâl (from the wall) lived like this around the 1900s. Only the poorest people lived in caves like this. During the second world war all men older than eighteen years old were called to Germany to work in their factories. German soldiers, together with Dutch allies, were deployed to find these men. Boys from around here dug this hole to take shelter when they felt endangered and sometimes had to spend the night here. 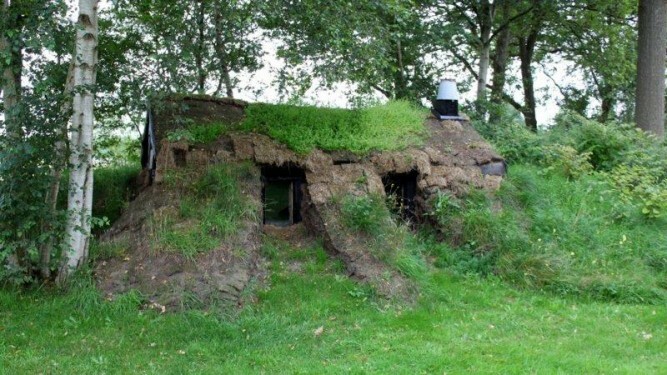 Their hiding place was never discovered by the Germans. In 1909 the Achtkarspelen Housing Foundation (S.W.A.) was founded. They started building bigger versions of the ‘Wâldhûskes’ with actual roof tiles. The back of the house remained purposed for stables or workspaces. These houses were sold along with a piece of land for growing crops or keeping livestock. When the shelters were being condemned, people started living in these houses. After world war 2 there was a huge shortage in housing, especially in this area. Young people wanting to get married had very little chance of finding a house. Sometimes the parents would build an extension to their own house but often the children were housed in the large chicken coops on the property. With some adjustments and remodeling these were made fit to live in temporarily. The children of the last family to live in this SWA house, all lived in this chicken coop for free after their marriage. This house is also a subsidized house from the S.W.A., but it was expanded by the occupants over time. 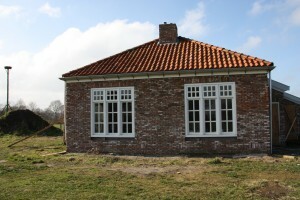 It is now used as an exhibition room. 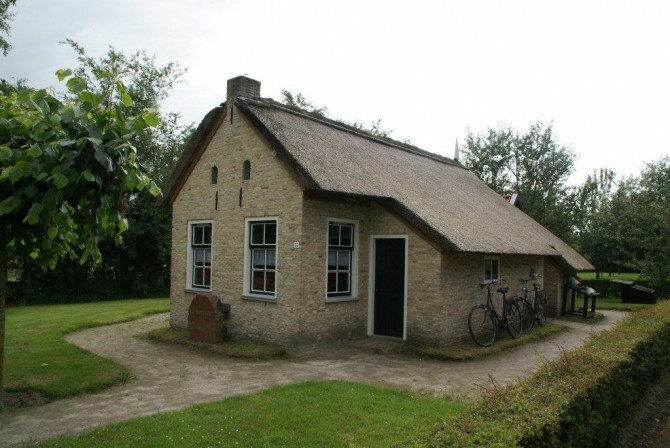 The house is named after Jelle Dam, a carpenter who described the abysmal living conditions at the time and did his best to improve matters for the people in this area. The exhibition area has a little shop, an authentic living area and display cabinets with interesting objects from that era. It also has an old style kitchen with objects that a housewife would have used in those times. This property was a house consisting of four single-roomed living spaces, each of them the size of 4 square metres, with two bedsteads, a table with a few chairs. A wardrobe and a small table with a paraffin stove to cook food on. These spaces were very small, yet four families would live in this one property. The living conditions were often very poor and children would wear the same clothes day in day out. They didn’t wash and were bare footed all year round. 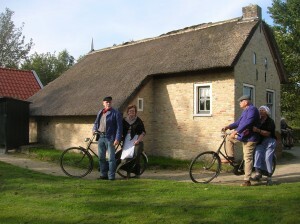 The ‘Mallemolen’ was burned to the ground by Mayor Van Ek and other people in 1958, as living conditions had become completely unacceptable at that time. The Mayor played a big part in exposing the problems of these slums.